We simply cannot imagine spending a day in a pair of denim. If you are like us, welcome to the club! This summer, say bye bye to your beloved pairs of denim and splurge on these bottoms. These are wise investments, miladies. There is nothing that screams summer better than peach colour, and we are totally digging this pair of loose fit culottes. Wear it with a white tank top or spaghetti and your summer look is ready. Got a work brunch or a lunch meeting? You've got to pick this pair of navy blue Jodhpurs from Nicobar. Very simple yet classic, this is our current crush, and it comes in two other colours. You can also check out the store in Banjara Hills to try it out! Ladies, isn't this love at first sight? This multi-coloured check skirt from Vajor is super quirky. Planning a Sunday brunch with your squad? This one calls out to you. We love picking our summer wear from June Studios. Because look at how fun this pair of tie-up pants is. You can pair it with a crop top or a pick a top from the same store. Whatever is your choice, this is a stand-out piece, for sure. If you are planning a night out with bae, ditch those bodycon dresses and get this purple skirt. We love the pleats and all the flair it has. Plus, it's such a lovely colour. 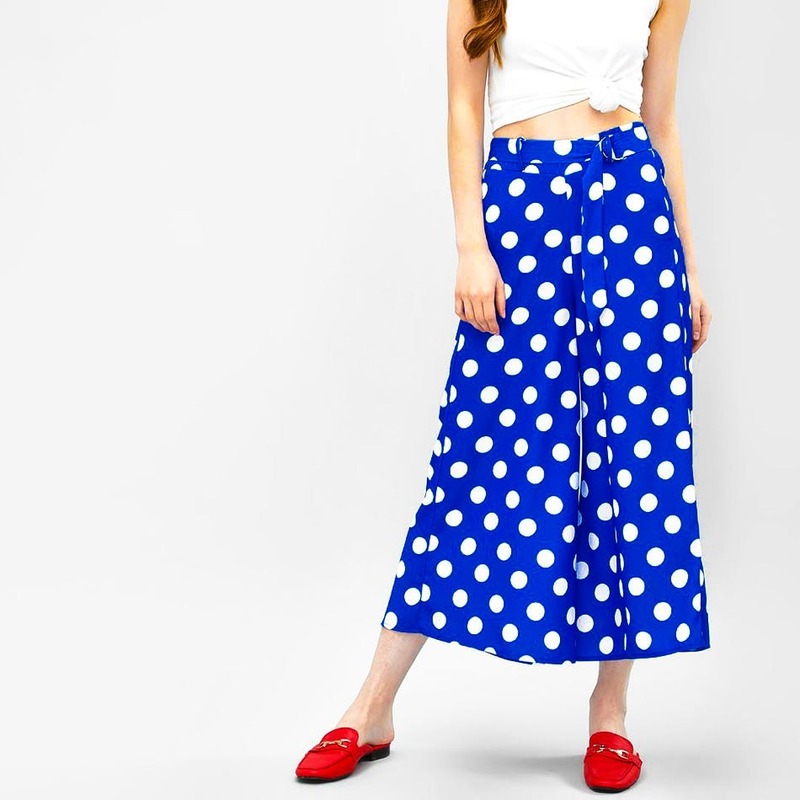 Step out in style with these polka-dotted culottes from Koovs. Love having fun with your outfits? This one is your best bet. Plus, you can pair it with something as simple as a crop top, spaghetti or a plain white shirt and go!